Very forgiving, with miscues unaffected. Not the most pleasing sound at impact. 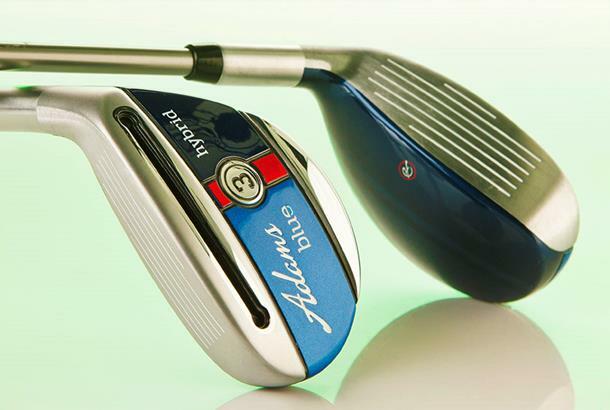 Adams reckon the Blue has three key technologies that can transform your game. A velocity slot improves face flex and ball speed. A low back CG increases spin and speed, while slimmer than usual shafts mean more kick at impact to allow you to launch shots into the air more aggressively. The Blue series is aimed at getting shots airborne so everyday golfers can have more fun. Its no surprise then that we saw the Blue launch and flight shots the highest, with the most amount of spin of all the hybrids we tested. Fairplay to Adams engineers, they’ve achieved their goal. But for anyone that doesn’t have an issue getting shots airborne the Blue uses up tons of energy going up rather than going forward, which means when it comes to carry distance its always going to struggle. If you need to bag yourself one of the easiest to hit hybrids available then you could do far worse than the Adams Blue. But remember if getting shots airborne isn’t your weakness we reckon there’s better more versatile hybrids out there.